Don Shelley has coached teams to nine South Carolina Independent School Association state championships, with the latest being the 2014 Holly Hill Academy team. That Raiders squad lost to Williamsburg Academy in the regular season before beating the Stallions in a state semifinal. Shelley is the new coach and athletic director at Williamsburg Academy. 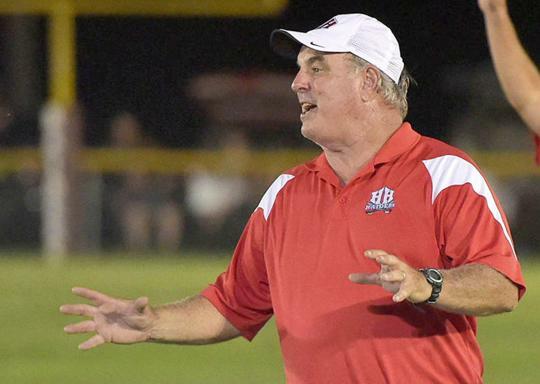 After a year away from the day-to-day operations of high school athletics, former Orangeburg Prep and Holly Hill Academy head football coach Don Shelley is back in the game, so to speak. As of this month, Shelley is the new athletic director and head football coach at Williamsburg Academy in Kingstree. Shelley has coached teams to nine South Carolina Independent School Association state championships, with the latest being the 2014 HHA team. That Raiders squad lost to Williamsburg Academy in the regular season before beating the Stallions in a state semifinal. Teams at HHA were still perennial contenders through an 11-2 season and state runner-up finish in 2016. But several graduating classes took away considerable talent and experience from the program and Shelley’s young 2017 team struggled to post a 2-8 record. In the spring of 2018, HHA officials told Shelley that after 12 seasons with the program (as athletic director, head football coach, head golf coach and high school social studies teacher), his contract would not be renewed. Including his previous 20 seasons coaching at Orangeburg Prep, Shelley had coached in Orangeburg County for 32 years. Having the past nine months away from the teaching, coaching and excitement of high school sports had Shelley thinking about getting back to the job. But while he spent days doing lawn care and pro shop work at both Lake Marion Golf Course and Santee Cooper Country Club, he wasn’t actively shopping himself around for a new coaching position. In fact, although he attended a Friday night football game about every week during this past season, Shelley said the Williamsburg opening was a surprise opportunity that came looking for him. “I missed being around the young people,” Shelley said after his first few days making the 50-minute drive from home to the Kingstree campus. “That’s the biggest reason I decided to get back into it. The opportunity at WA opened up because former athletic director and head football coach Ken Kellahan decided to leave coaching for a different career. “I’ve known Ken since he was in high school playing, when we used to play them twice a year, every regular season and most of the time again in playoffs,” Shelley said. “I’ve always liked and respected him, and he had an opportunity to go into the business of banking. He was going to step down, so the folks at Williamsburg Academy called me. I had thought about it (getting back into coaching), but I hadn’t talked to anybody else. This just came up and seemed like a good fit. Shelley admitted he is experiencing a bit of “data overload” while learning the Williamsburg Academy students’ names and more about how he can help the entire athletic department through the current spring sports seasons. He has already spent a little more time doing lawn care, as he mowed the softball and baseball fields for recent home games. “I’m getting there, learning what all I have to do,” Shelley said. “As for the football part, we have a good group of seniors who have played for a while and have got some experience. The staff, hopefully we can keep it together, since they are good guys who have been working with the kids before. I’m getting to know them better each day. Plans are being made for spring football workouts, as Williamsburg football players who aren’t busy with baseball, track or taking weightlifting classes began weightlifting for football this past week. Shelley believes that having a coach come to the football program in the spring, as opposed to the normal summer hire, will benefit both the Stallion players and the coaching staff. “I think it’s more important for me, in that instead of going in during summertime, I’m going to know them better when summer gets here,” he said. “I’ll be able to set everything up beforehand. Even so, Shelley has been around long enough to know that Williamsburg has been a powerhouse program at times through the years. After a 7-4 season in 2016, the Stallions followed up with an 0-11 record in 2017 and a 3-6 record last season. Shelley said nearly a dozen parents, particularly dads, have come up to him at Williamsburg and talked about playing against his teams in years gone by and the competitive games the Stallions had when he was on the opposing sideline. Now those same parents are looking forward to Friday nights, under the lights, with their sons playing on a team led by Shelley’s coaching. As for the coach himself, there’s some excitement, but not so much concerning walking the sideline or chalking up more wins. “I feel like I got my batteries recharged, to a certain degree,” Shelley said of being away from coaching for a season. “The sideline on Friday night is OK, but I’m more interested in getting out on the practice field. So, from last year, when he mostly dealt with golf course grass growing, now Shelley is back to helping shape the lives and experiences of student-athletes as they grow. “I hope I can do a good job for them,” Shelley said. “Williamsburg Academy has good people who support the school and they support athletics.